This award is presented to a volunteer Cruising Station host who has assisted visiting cruisers and particularly SSCA members in a significant capacity, and who has made an effort to promote SSCA and recruit new members. The award is named for George and Dorothy Bateman, of Opua, New Zealand. The Batemans became an SSCA Cruising Station in 1984 and received the Cruising Station of the Year award in 2005. Their outstanding support and assistance to cruisers is described and documented in the November, 2006 Commodores Bulletin. Karen Thurman and Evan Kolb are the recipients of the 2017 Bateman Cruising Station of the Year award. 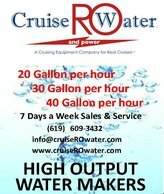 During and after Hurrican Irma hit the Florida Keys, Karen and Evan made an enormous difference for the cruising community during this difficult time. Karen, who is the manager ot fhe Hyatt Hotel in Marathon, took over the coordination and distribution of relief supplies from her hotel's parking lot and sent a minimum of five semi-trailer truck loads a day to Key West to help in the relief efforts. Karen and Evan exemplify the SSCA spirit of camaraderie of cruisers helping cruisers.